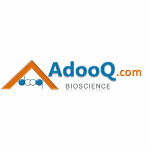 Adooq Bioscience, located in Irvine of California, is one of the world leading suppliers of high-performance life-science reagents and reference compounds for the non-clinical research fields. Adooq is fully dedicated to and focuses on the complex research of biochemicals, and aims to provide the most innovative range of research reagents at the most competitive price. Adooq has more than 3500 inhibitors and has established long-term and stable relationships with over10,000 customers from pharmaceutical and biotechnology industries, universities and government institutions and related organizations. AdooQ understands the importance of quality, not only in the services provided to clients, but in all aspects of how we do business.